Aaron Scott was once again in a class of his own in yesterday’s Folksworth 15. 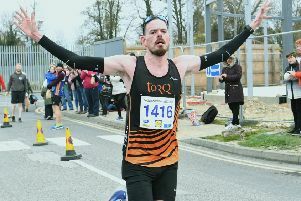 The Stamford-based road running ace, representing Lincoln Wellington AC, made light work of the tricky conditions, speeding through the snow to win the event for the fifth year running. He completed the course in 1:21:38 and that was almost four minutes clear of runner-up David Hudson from BRJ, who finished in 1:25:10. Third was Phil Martin of Peterborough AC in 1:28:07 and fourth Michael Channing of Bedford & County in 1:29:10. First lady home was Tracy McCartney of Bushfield Joggers in 27th place in 1:39:54. She finished just ahead of Maggie Skinner of Stamford Striders (29th in 1:40:31). Third lady was Zoe Smith of Rutland Running Club (40th in 1:42:46). The event, organised by Yaxley Runners and Joggers, attracted 433 runners.